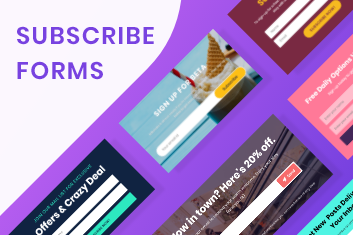 Show beautiful responsive subscribe forms anywhere you want on your website. Customize your forms and integrate them easily with your emailing system. Capture more leads and grow your email list! Can I use Subscribe Forms on more than 1 domain? How long is my paid Subscribe Forms license valid for? Once you purchase any paid plan of Folders, you can use it forever. Support and updates are available for 1 year. You can renew your license each year to get another year of support and updates. Will Subscribe Forms stop working if I don’t renew my license? Your Subscribe Forms plugin and all your settings will continue to work as before; however, you will no longer receive plugin updates including feature additions, improvements, and support. If you are not satisfied with the plugin or it doesn’t work for you for any reason, you can email us at [email protected] within 30 days after your ourchase and you will get a refund. You can create unlimited forms using only 1 basic template.